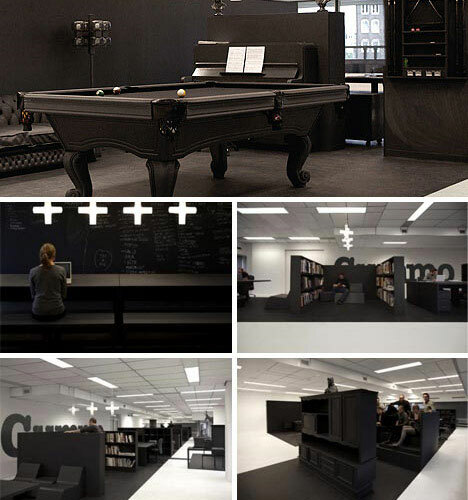 When it comes to aesthetics, offices tend to get the short end of the stick. They often seem like an afterthought, filled with drab, purely utilitarian furniture that doesn’t exactly inspire creative thinking. 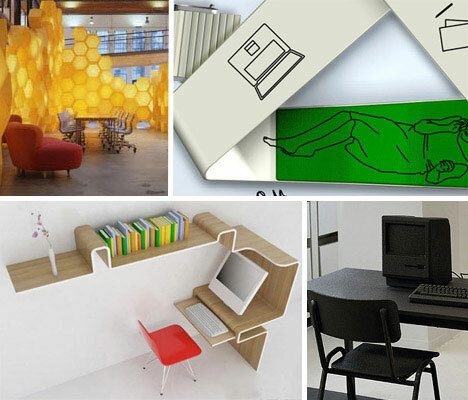 These 12 modern, clever and sometimes wacky office interiors and desk designs are the antithesis of boring corporate cubicles, serving as stimulating backdrops perfect for brainstorming sessions. 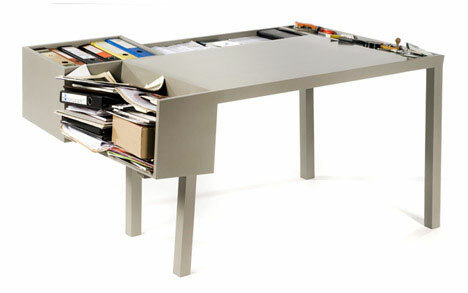 When you need plenty of organization but are short on space, a combination desk/shelving system with a small footprint is ideal. Consisting of a single strip of curved wood that serves as a desk, bookshelf and modern art piece, this unusual design by MisoSoup is sleek, multifunctional and perfect for apartments, condos and dorms. 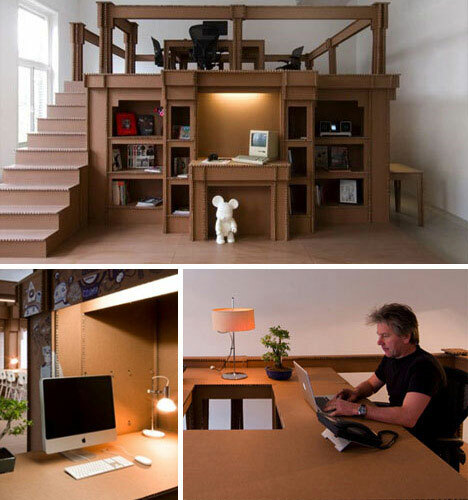 Cardboard may not seem like the ideal choice of material with which to build an entire office space, but it has been proven surprisingly strong and aesthetically pleasing at the innovative offices of Amsterdam advertising firm Nothing Agency. From each office nook to the coffee table in the waiting area, nearly every element in the building is constructed from this inexpensive material, which also serves as a canvas upon which to sketch creative ideas. There are three ways in which we work, relax and interact in an office environment: social/interactive, functional/focused and casual/private. 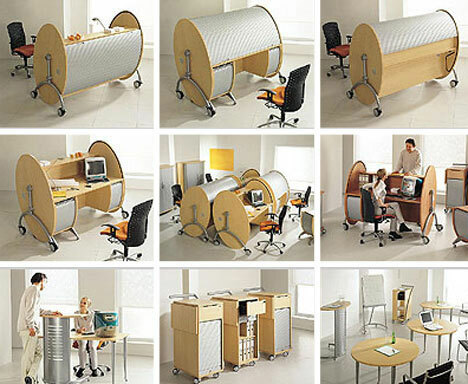 That’s the idea that designers o4i used to create this thoughtful all-in-one desk concept, providing a standing area at which to present ideas and communicate with others, a desk at which to sit and work, and a relaxing lounging space in which to dream up new ideas. This office full of upcycled vintage furniture proves that when in doubt, spray painting a less than beautiful item black can work wonders. Flea market and garage sale finds that would have looked like a jumble of mismatched objects are suddenly modern and unified, especially when juxtaposed with the white of the room’s floors, walls and ceiling. If you buy a home without the necessary space to house an office, adding a custom modular extension can be the perfect solution – especially when it’s easy enough to DIY. 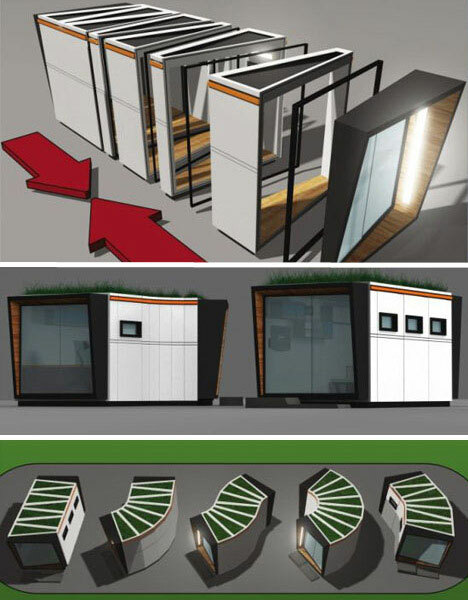 This outdoor ‘office shed’, designed by Stephen Meir, consists of a modular system of parts that can be configured to create a modern office space in a variety of shapes according to your needs. 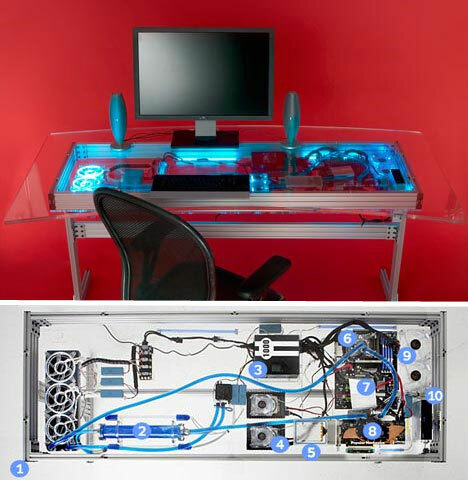 For the tech geek that loves to disassemble electronics just to gaze lovingly at their inner workings, this combined computer-and-desk designed and built by Popular Mechanics might just be the ultimate in office furniture. Each part is illuminated by LED lights and surrounded by clear laser-cut acrylic, cooled by fans and liquid. 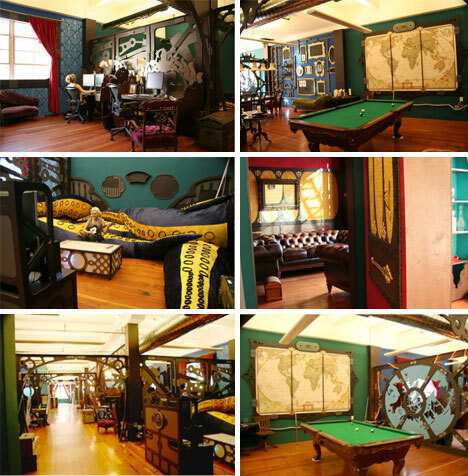 Colorful and undeniably unique, this custom steampunk-inspired office space created for Three Rings certainly doesn’t skimp on intricate artistic details but was surprisingly inexpensive to bring to life. Equipped with the requisite gears and cephalopods, this office even has a video game area with a gigantic squid-shaped couch boasting 20-foot-long tentacles. 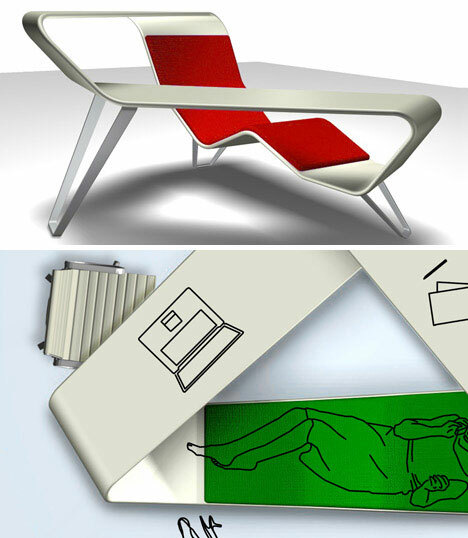 When designers set out to create ultra-minimalist furniture, they must come up with creative ways in which to balance form and function. 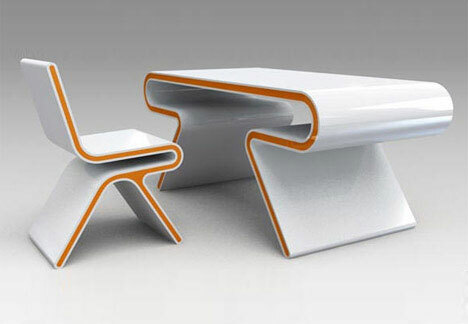 This Omega desk-and-chair set by Atomare is carefully engineered for comfort, visual appeal and ease of use, with convenient storage space below the desk’s surface that eliminates the need for drawers. 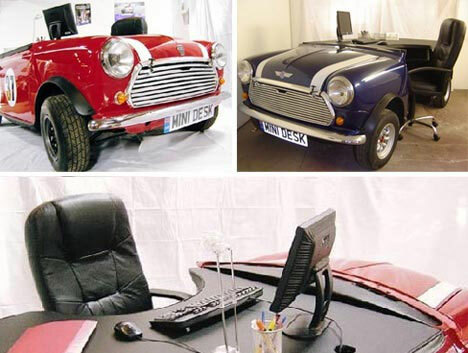 While the usefulness of working headlights, hazard lights and a horn is debatable, these custom car desks created from Mini Coopers are a car enthusiast’s dream. Buyers can choose between leather, wood, metal or colored vinyl for the desktop and even the car itself can be painted to match the space it’s intended for. And, while they aren’t cheap, these made-on-demand desks have a smaller price tag than one would expect, clocking in under $5,000. 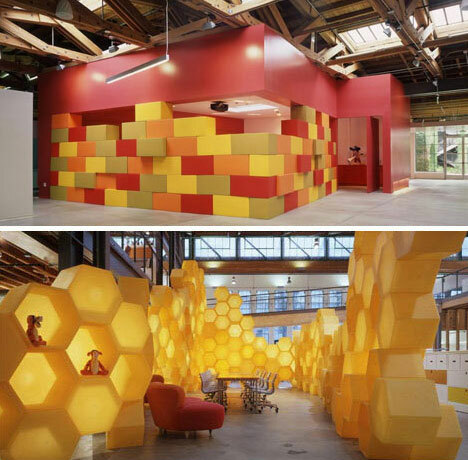 With giant honeycombs that act as storage and room dividers and a meeting space with a building-block wall that can be disassembled and turned into seating, this is a fun and colorful office space fit for a children’s toy company. Designed by Clive Wilkinson, the former warehouse now acts as the vast, playful headquarters of the Disney Store. Steel and pale-colored wood combine to give the rolltop desk a modern makeover, with a compact curvilinear shape and wheels for portability. Designed by Mebelux, this lightweight desk is perfect for small office spaces with a modern aesthetic, closing to hide clutter and easily rolling into the corner when necessary. Can you get away with being messy, yet somehow organized at the same time? 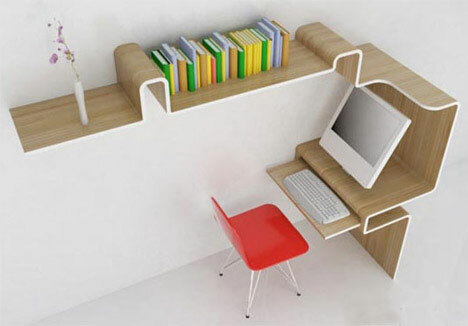 This clever desk design allows a sort of controlled chaos with nooks and crannies in which to store items that would otherwise be scattered across the desktop or shoved into drawers.